This weekend I was at Parkdale Flea. Now, I’m no business major but I think when it comes to sales you want more quantity, and quality doesn’t matter. This weekend quantity wasn’t really in the cards at the Parkdale Flea as there weren’t too many attendees. However, I got two really quality sales and I’m thrilled about them. 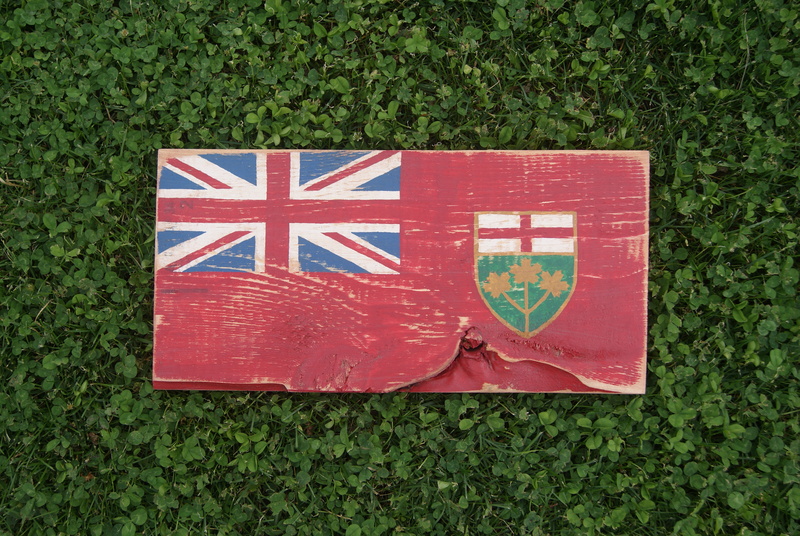 Andrew generously bought this Ontario flag, a personal favourite with that interesting knot at the bottom. Later in the day a cool dude (not a descriptive phrase I use often, but incredibly appropriate in this situation) came by my booth. He informed us that there was a video shoot going on at a music studio around the corner. He pondered which flag he should buy, the internal debate occurring because, as he said, “they’re all evil in their own way.” I promptly decided that was the coolest compliment I could ever receive for my flags. He decided on a Canadian flag and as he was buying his flag said that he “liked supporting people who were out there doing it” because he too is an artist. My mom was there for this whole encounter and after the cool dude left we debated about what his role was in the video shoot around the corner. Roady? Musician? Groupie? At the end of the day, our neighbouring vendor informed us that his name is Tom Wilson, a Canadian musician from Hamilton. We promptly did a google search of “Tom Wilson Canadian Musician” (there are a lot of Tom Wilsons) and he had the fame verifying wikipedia page. So Parkdale Flea wasn’t a quantity day but a quality day. Thanks Andrew and Tom! I leave you with a video of Tom performing the song Shine from his band Junkhouse.